Skiing First Tracks, How and Where! We love skiing first tracks; it is like having your private ski mountain. We have experienced first tracks in perfect cord, on squeaky talcum powder snow fresh from the snowmaking guns, and up to a foot of dry light fluffy snow. The conditions for first tracks vary, but they are typically the best of the day, and the camaraderie is high quality too. You are in company with others who prioritize skiing, are willing to get up and out of bed, even pay a little extra for the private privilege. We have enjoyed first tracks at boarding the Silver Queen Gondola at 8am Aspen in Colorado, or first chair at Grand Targhee, and Sunday River to name a few. One of our favorites is Sunday River, when you get to ski with Sunday River management – perhaps even the General Manager, Dana Bullen, one of the nicest guys you will ever meet, and a great skier to boot. Sunday River’s First Tracks are on weekends and holidays by invitation, you must have a lift ticket or season pass as well. Once you have signed up at least 24 hours in advance, you get to load the Chondola to North Peak at 7:15am for 45 minutes of privileged skiing with management – often Sunday River’s General Manager Dana Bullen, typically on Spruce Peak, prior to the lifts opening to the public at 8am. First Tracks skiers and riders also get to be the first at the Peak Lodge for hot cocoa and warm cinnamon buns just coming out of the oven. When you take a break at 10am, after ten laps, you see the sea of skiers arrive. You can just imagine they are wondering who tracked up the trails already, while you reflect on your early exclusive runs. Sugarbush has first track cat skiing at Lincoln Peak for $75, up to 12 skiers and snowboarders board the Lincoln Limo snow cat at 7am for private skiing prior to the lifts opening. Don’t be surprised if Sugarbush’ owner Win Smith shows up for a winning morning with you! 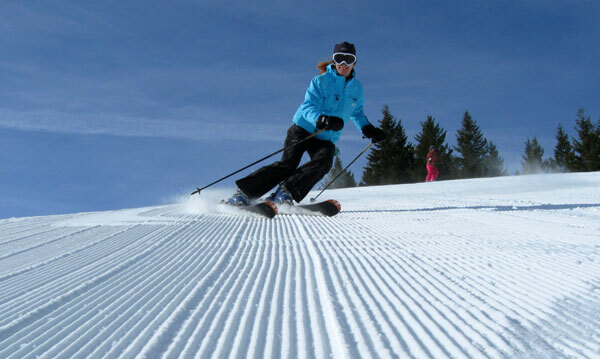 First Tracks is like the backstage pass of skiing, you should be an expert or advanced skier or rider to keep up with the enthusiastic group. You will be on the mountain with patrol and usually some major players from ski area management. Of course, you have to drive to the ski resort at dawn, but when you board that first chair and the early sunlight is sparkling off the fresh snow awaiting your ski signature, it’s worth every second stolen from your pillow.